Well, what can i say!? I suppose it was inevitable after seeing the tables turn on stage 18 where Shleck reminded us of what he is capable of, and Contador looked to have all but given up. I guess i just wanted Voeckler to win because we all love to root for the underdog, he said it himself though on Thursday night though, and most nights before that, that he wouldn’t be wearing it in Paris. I honestly thought though that he’d broken the back of the Alps, being as yesterday was a much shorter stage in comparison to the previous days, but perhaps the accolade that winning the Alp D’Heuz stage affords was too much for the big guns to pass up! Like the commentators on ITV4 said last night though, hats off to the tour organisers for giving us an event that it still undecided with only two stages to go! Contador attacked 16km into the stage as he sought to reduce his arrears, and continued to attack as the day wore on, unbelievable to watch after his performance the day before suggested he’d hung up his cleats for this tour. His efforts failed to gain enough time on Andy and Frank Schleck though on the 109.5-kilometre 19th stage from Modane Valfrejus to Alpe-d’Huez to making victory after the time-trial in Grenoble today an unrealistic ask. A valiant display of will in the face of so much controversy where he met the start of the tour to boos, he was greeted at the finish line yesterday with adulterous applause. The Shlecks now top the general classification with Australian Cadel Evans in third place and tipped to take the yellow jersey before Sunday’s ride into Paris, but when interviewed post stage, he was non-commital and in fact said “I have been in this stage two times before, and two times before i have failed”. He didn’t come across well to the cameras, he wasn’t a happy chap! It is Pierre Rolland we should be talking about though, what a day, and what a day for France. Apparently earlier in the stage, Voeckler leaned in to his lieutenant and told him “go for it Pierre, it’s over for me”. 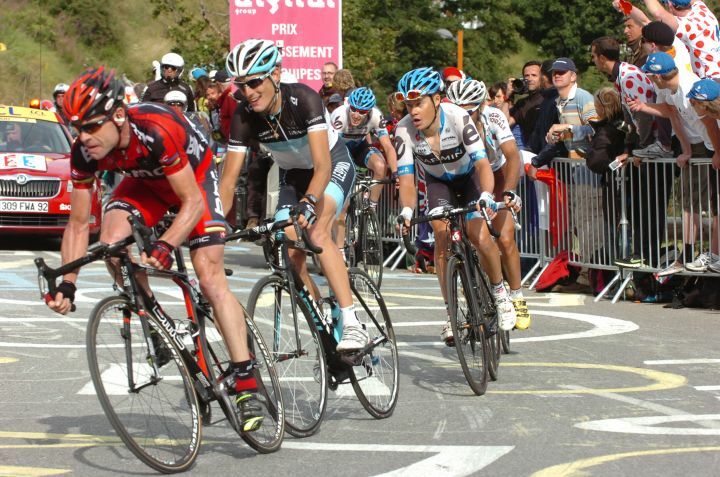 At this Pierre found his focus and commited to win the stage for Voeckler, for France, and for the White jersey on the infamous Alpe D’Huez, and that he did with Samuel Sanchez second (sealing his bid for the king of the mountains), 14 seconds behind, and Contador another nine seconds further adrift. It was a great day for French cycling, their first stage win of this tour, and such an important one. Not forgetting Cav, the points classification leader rolled in as part of a large group, 25:26 behind. The time limit was set at 25:09 and Cavendish and the rest of the grupetto were docked 20 points as they were the day before. The good news for Cavendish, though, was that his nearest rival Jose Joaquin Rojas (Movistar) was also in the grupetto so the points penalty doesn’t affect his 15-point lead. Looking forward to the time trial today, i reckon the race could still be won or lost in Paris, and so to could the maillot verde! This entry was posted in Biking and tagged Tour de Fance. Bookmark the permalink. Cuddles – Cadel Evans!? LOL, not heard that before!! I’ve really enjoyed reading your tour coverage….